Buying time, that is truly what security is about. Security stops no one, it only provides enough time for you to react to a threat. I’ve spent my professional life in the physical and electronic security world, protecting high value assets throughout the United States. Ultimately speaking, my job is to purchase time. I’ve shared some of the basic tenants with you before in several articles and videos. One to read in particular is 4 Rules of Property Protection, where I lay out these tenants for DIY prepper security. I work in a world where millions of dollars are thrown around to keep folks out, or keep them in. The problem with relating this level of security to the average prepper’s homestead is the level of dollars it takes to employ the latest security measures. It is akin to the military having billion dollar B2 bombers, million dollar Patriot missiles and MRAP’s when we mere civilians are left with semi-automatic pea shooters with not quite so adequately sized magazines. But just like time has proven ingenuity and a hardscrabble approach to war can trump dollars and technology, so too can inexpensive security equipment protect prepper’s property. The key is in the application. Two ways to gain the upper hand against an intruder are to detect or deter them. I give this analogy; you are sitting on your front porch with a mile of open field before you. S has H the F, and anyone running towards your home in a black ninja suit is probably an adversary. If they had to run a mile you might have six, eight, ten, or in my case fourteen minutes to do something about it. Here, your eyes are doing the detecting. Being a mile off leaves you plenty of time to grab your .338 Lapua scoped McMillan, a sandwich, and attempt to neutralize the threat. If you miss on the first shot you might deter the person from running any closer. If your name is Chris you might not miss, in which case you have neutralized the threat. Because you could “see” the threat a mile away you had time to react to it. Security devices attempt to do just that, afford you time by placing a sensor that can detect a person and alert you to their presence. The mere fact that we are preparing for detecting intruders in a grid down situation adds complexity; it may limit our power options and take devices and methods off the table we might normally use. For prepper security we need to find options that can fit in our budget, run on little or no power, and yet provide a high level of detection with minimal false alarms. Many of you may think of security as a way to find out what happened, forensic evidence. In a grid down world, after it happens it is too late, this article focuses on real time security. Also, lots of basic DIY prepper security items simply don’t make the list because they require too much power for consideration in a grid down world. A problem I run into, even in the world of giant budgets, is the level of security one can afford. 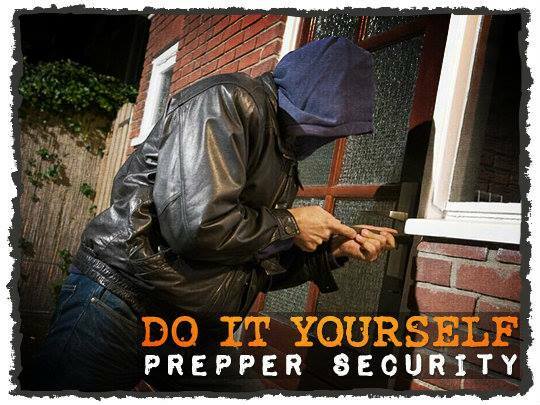 The further away you can detect an intruder, the more time you have to react. Unfortunately, the further way you wish to detect an intruder, the more area you have to cover. This can involve more or better sensors and can be very costly. More often it involves strategic placement of sensors and probabilities. What do I mean? A simple example might be this; you own a nice secluded homestead set back from the road on a wooded lot. The easiest way to gain access to your property would be the driveway. Getting into the mind of our sample criminal we know that not all of them would choose this path, the smartest might avoid it, but statistically speaking most would use the driveway. 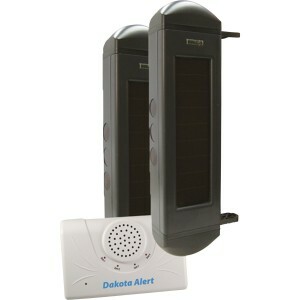 A simple low cost sensor that I would use in this situation might be this Chamberlain Wireless Motion Alert System. The transmitter is simple, battery powered, and can transmit up to a half a mile. The base station receives the signals and provides an audio alert when the beam is tripped. The sensor itself is limited to a 30 foot range, but in most cases this would be enough to cover a drive. The system can be expanded up to 8 sensors to cover other strategic areas. Assuming we will be operating this system in a grid down scenario, you will have to consider power for the receiver. The transmitters require four AA batteries and have low current consumption. Something as simple as this Goal Zero solar charger could keep multiple transmitters (as well as lots of your other AA powered devices) up and running. The issue you might have is with the base station. While you can power it via four AA batteries the current consumption of 150-200mA would have you changing them out every couple days. Even basic, low powered devices such as this aren’t suited for being powered via small batteries. It isn’t the end of the world, but if your home isn’t “off the grid” already you will be searching for alternative means of powering lots of things, not just security devices. A good place to start might be the Renogy 100 Watt Solar Kit, Deep Cell Battery, and Inverter. With any solar kit we look for overkill, a larger panel such as the Renogy coupled with a 35aH deep cycle battery would get you through the cloudy spells with capacity to spare. I used the Chamberlain to illustrate point security, how to be notified of an intruder at a great distance through the strategic placement of a sensor. Some folks may need to cover a greater distance, be it an entire perimeter or an open and easy method of approach. As I mentioned, the more area you need to cover, the more the cost. Luckily, there is a solution that almost perfectly fits a prepper’s requirement. 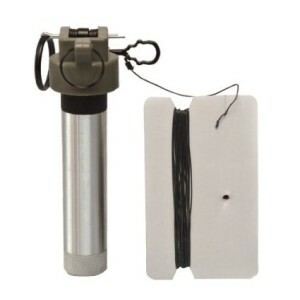 This Dakota Alert Beam Break sensor kit is almost tailor made for the prepper. Beams are often used in perimeter security, they work by sending an invisible beam from a transmitter to receiver. Each unit contains multiple beams, that when broken, trigger an alarm. These particular units can cover up to a 300ft. distance. Once tripped, they report via wireless back to a receiver, which will provide an audible tone or relay out to alert you of the intrusion. Up to four sets can be paired to a single receiver allowing you to monitor a 300 by 300 foot square or almost a quarter mile of space on a single side of property. Luckily, each set can be designated to play a different tone. This allows you to differentiate which “zone” has been tripped, letting you to determine roughly where the intrusion occurred. What makes the Dakota’s nice for grid down are the field units operate on a solar powered lithium-ion battery. There is no need to worry about changing rechargeable batteries on a constant basis out in the field. The base unit can be powered via a 12 volt battery or through an inverter, like in the aforementioned solar kit. The receiver also provides a relay out for those of you wishing to connect to other devices on the occurrence of an alarm (security lights, home automation, a giant siren, or grenade). As a side note, Dakota also offers a point security sensor similar to the Chamberlain with a greater range, albeit at a greater cost. It too can be paired to the receiver in the beam kit. Lastly, for those of you with really long driveways, or for those who want to know if someone is travelling up a mountain pass miles away, Dakota also offers a MURS based system. MURS can extend the range of detection up to a few miles. Because of excessive battery consumption I don’t consider this an “out of the box” solution, but with some tinkering, a small solar panel here, a battery charger there, it would be viable. The alerts from Dakota will give you from precious seconds to minutes to enact your security response plan, but at a cost. The costs of deploying a Dakota type system can run from around $250 to over a thousand, depending on how much coverage is needed. That being said, you are probably not going to get the job done for any less. With prepping dollars competing for resources, what happens if we don’t have that kind of money laying around? Dogs or ducks may be a good inexpensive early warning system but there are a few security “hacks” you could employ that are low cost. 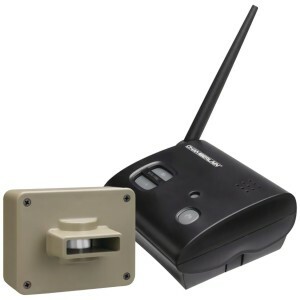 The first suggestion is to rig up a personal security alarm, like this one from Vigilant. This solution involves a bit of elbow grease. The unit works by pulling the pin on the top of the alarm. When the pin is pulled, it will emit a high pitched 130db screech. What you may want to do is transform this ready made personal alarm into a trip wire system. First, you are going to have to affix the unit into a weatherproof box. Second, replace the supplied cord with low visibility fishing line. The line can then be strung between two trees OR you can utilize small eye bolts to go around corners and lift the slack. This is a mechanical process that will take some trial and error to get the tension correct on the line. Once you have this sorted out, if an intruder trips the alarm, hopefully the sound will scare them away and alert you to their presence. One other reason I considered the Vigilant for this role is it also uses common AAA rechargeable batteries. Another take on the same idea uses compressed CO2 to produce a loud “bang” when the wire is tripped. The Valken Tactical Thunder looks like a miniature grenade, and in a sense it is. Instead of a piercing siren, when the wire is tripped the device lets all of the pressure from a CO2 cartridge out with a big bang. While it doesn’t rely on batteries, testing may be another issue. Each time the Tactical Thunder is tripped, you need to reload it with a new cartridge. One upside, your intruder may think someone is taking a shot at them. This, again, falls into the deterrence camp. Hopefully the bang will send them off running. If you are lucky they will trip, fall, and break their necks. At this point most of you are wondering why I haven’t mentioned cameras. There are lots of good reasons. First and foremost, cameras available to the average prepper budget do not detect anything, they are an assessment tool. Sure, I will get the odd comment that cameras have motion detection or analytics. Trust me, in the low end of the market it doesn’t work. The systems don’t have the smarts to tell the difference between a person and a paper bag. Second, power consumption. I guess if you had the budget for a good camera system, you might also have the budget for a decent alternative power system as well, but your cameras, DVR’s, and monitors will exceed the capabilities of the above mentioned solar system. Camera systems simply require too much power to be viable with a very basic off grid power system. Third, the cameras in a prepper’s budget are going to be of limited performance. A camera that can see well in all lighting conditions is going to cost many times more than some of the entire systems most would consider for prepper security. That being said, if you can meet the power requirements off the grid, even the cheap ones can be useful. 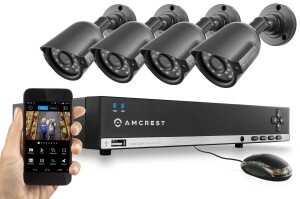 I’m not recommending it, but I will dissect this inexpensive system from Amcrest. I picked it solely because it had high ratings on Amazon. What this system is not going to do is provide you with CSI forensic evidence. It’s not going to let you identify your would be intruder. What it could provide is this; situational awareness in a small perimeter around your home. It may provide friend/foe recognition. It may help you see if the assailant has a firearm. At best, if one of your other alarms trips you can refer to your monitor to tell if someone is directly approaching your home. If the grid is down and no ambient lighting or skyshine is present you are only going to see maybe 50-60 feet out. Why? Cheap cameras have poor low light performance, they compensate by adding IR illuminators. These illuminators are basically small LED flashlights that emit infrared light that your eye cannot see, but the camera can. Because of this, in total darkness, the cameras are limited to the range of the illuminators. This camera package states 65 feet of IR illumination. They are also made in China, which usually means divide any stated claims in half. I am being generous at 50-60 feet. This quick assessment may provide you with the necessary information on where to position yourself for a response or which door to retreat from. Again, I am not against cameras by any means, but you should really first focus your efforts on 24 hour detection. You dollars for detection will go a lot further with other methods. But is isn’t quite over. You can still buy a few more seconds. A properly installed door may take more than one kick, it might take two, three, or ten. This might mean an extra few seconds to respond. The EZ Armor Security Door Combo Set is one of the products featured in our “How To Harden Doors and Windows” video. It anchors your exterior doors to the more substantial house framing rather than just the flimsy door frame. The same can be done for windows with something like this security film. Security film won’t stop someone from breaking your windows, but it will vastly increase the time. In the end, employing some or all of these security measures achieves the desired result of buying you time. This time has been tipped in your favor to be wisely used in your response to the intruder. At the beginning of the article I mentioned an article called “The 4 Rules of Property Protection”. This article covers some of the hardware involved in implementing the principles. If you are interested learning what rules security professionals follow, check it out.